Island Cove community is sold out and is not in active development by builder. If you are interested in Island Cove or similar new home communities, contact us today! Our agents are very familiar with new and newer construction in Poquoson, and can identify resale opportunities in Island Cove, as well as builder inventory available in nearby or similar communities in Poquoson. To view 8 more pictures, interactive maps and the full, detailed description of the Island Cove community, please Login. Choosy homebuyers can find new homes in the new construction development of Island Cove. Properties in this tiny complex remind residents how good life can truly be. Located in northern Hampton Roads in Poquoson, VA, this community allows for relatively easy commutes to military bases like Joint Base Langley-Eustis and Naval Weapons Station Yorktown. New construction properties that look like these are rare finds in Poquoson. When buyers find new homes in this development, they are likely to be impressed. Each of the homes in Island Cove come with a foundation with crawl space, 30-year roof shingles, landscaping package complete with Bermuda sod, two-car garage, carriage house style garage door and more. Homebuyers walking into an Island Cove home may want to stay longer than usual. After taking the time to find new homes, it’s best to take more time go through the properties. Each new construction home here may feature smooth ceilings, hardwood flooring, crown molding, chair rail, brushed nickel door hardware, Kenmore appliances, Moen faucets, kitchen pantry, natural gas heating, 10-year limited home warranty and much more. The name Poquoson is actually Native American and means “great marshy land.” This region of Virginia is greatly influenced by the surrounding water. Boaters can access deep water from the Dare Marina and Yacht Sales so they can go on fruitful fishing trips. Owners of these new construction homes can participate in one of the peninsula’s best-loved events, the Poquoson Seafood Festival. Each October, tens of thousands of people come to celebrate the heritage of those who fish the Chesapeake Bay. Purchase arts and crafts, check out the entertainment, listen to bands and of course, eat some of the fresh seafood. 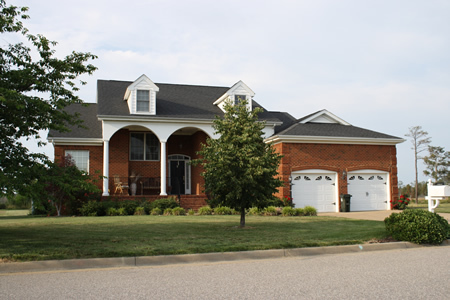 When looking to find new homes, don’t forget to check out Poquoson. This area has a rich history and waterfront scenery that practically begs for photos. The properties in Island Cove offer quality new construction in a pristine environment. Is there anything better? Send me more information about communities similar to Island Cove. Our agents gladly offer FREE property tours of Island Cove, Poquoson and homebuyer consultations to all serious buyers. Our Poquoson SH Pro is prepared to represent you and your interests so you can move into your dream home.